UPDATE November 2008 -- Now that the Throttle Rocker has been installed for several months, I'll have to revise my final (below) comment -- it DOES become irritating when riding arouond town, for two reasons. (1) it gets in the way at some throttle-twist positions when accellerating and changing speed, no matter where it is positioned. (2) it creeps; maybe my right hand grip isn't sticky enouogh, or perhaps I'm too weak to tighten the retaining strap, but the palm pad slowly repositions itself. It takes hours or days to move, but eventually I'm forced to remove it reposition it and snug it tight again. None of this is a deal-breaker; the T-R is so easy to remove and replace that it takes only a few seconds to loosen it and toss it in the trunk until it is needed again for a longer road trip. Still worth the price; but try to buy yours locally since shipping costs are nearly as much as the gadget itself! (Original comments - August 2008) My first "long" ride on the Helix (only about 150 miles) was refreshingly pleasant . . with one exception; my right wrist and hand suffered from holding the throttle is roughly one position for about six hours. If I had asked Rachel, the owner, she could have sold me this clever little gadget, the "Throttle Rocker" -- which would have saved me the sore wrist and hand, and likely the cost of shipping too. When I returned home, I looked up the ad in the AMA magazine and ordered one online. Held in plalce by a Velcro strap, the "Rocker" allows you to hold a throttle position without gripping the handlebar tightly. First, wipe the handgrip with a little alchol to remove any oily residue, position the gadget loosely. 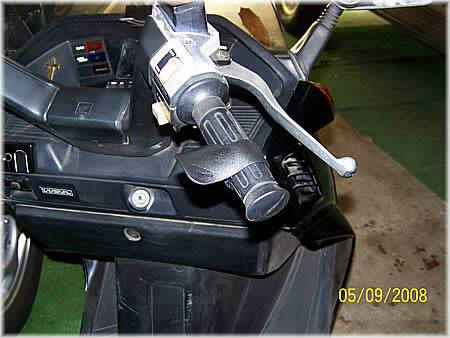 Now sit on the bike, and with your hand in a normal riding position, fingers on the brake lever. Move the Rocker (Only! 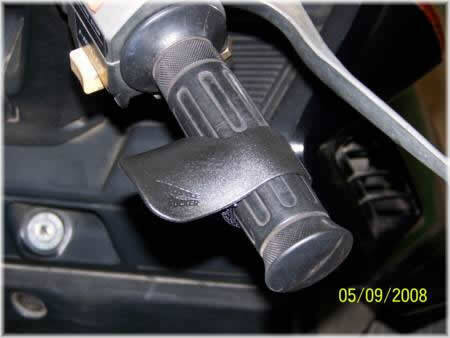 Not the throttle-grip!) until the heel of your hand rests lightly on it and your thumb "hangs freely" over the curved side. This thumb position is critical for easy braking. Now snug up the strap hard, and "seal" the Velcro firmly. Although it took some getting used to, after several hours of local traffic riding, I do not find the "Rocker" at all irritating. ©2006 Bill Laudeman; all rights reserved. Page updated Saturday, November 15, 2008 14:23 Eastern time.